광배(光背)와 대좌(臺座)를 따로 가지고 있는 독립된 불상이 삼존불(三尊佛)을 이루고 있다. 본존불은 당당한 체구의 불상으로 머리에는 큼직한 상투 모양의 머리묶음이 있고, 직사각형에 가까운 얼굴에서는 강인한 인상을 풍기고 있다. 어깨는 넓고 당당하며 군데군데 옷 사이로 드러난 신체 역시 당당하고 강인한 느낌을 준다. 양 어깨에 걸쳐 입은 옷은 가슴에서 발목 부분까지 U자형의 주름을 이루면서 내려오고 있으며, 다리 사이에는 바지 자락이 표현되어 있다. 부처의 몸에서 나오는 빛을 상징하는 광배는 배(舟) 모양으로 불상과 같은 돌로 만들었는데, 파손이 심해서 세부표현을 확인하기 어렵다. 왼쪽 협시보살도 왼쪽 어깨에서부터 오른쪽 허리까지 부러진 것을 복원하여 놓은 것이다. 얼굴은 본존과 같은 형태지만 훨씬 부드러우며, 허리를 왼쪽으로 약간 틀어 몸의 중심을 본존쪽으로 두고 있다. 옷은 밑부분이 넓게 퍼져 무겁고 둔중한 느낌이 든다. 오른쪽 협시보살 역시 모든 면에서 왼쪽과 같으나 윤곽이 둥글고 앳된 모습이 다르다. 당당한 신체표현, 강인한 신체묘사, 유려한 각선 등에서 상당한 기량을 보이고 있지만, 평판적인 신체묘사와 형식화된 조각기법으로 볼 때 고려 초기의 작품으로 추정된다. 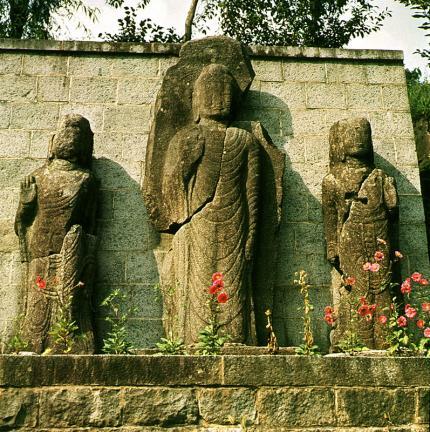 This Buddha Triad is composed of three statues, each with its own separate mandorla (Buddhist halo of light) and pedestal. 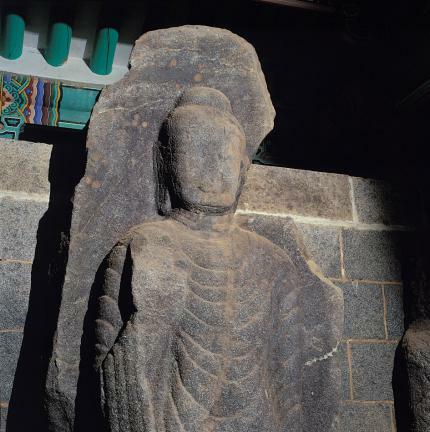 The principal Buddha statue has a solid body and a rectangular face with open eyes and a long nose, giving a sense of strength. 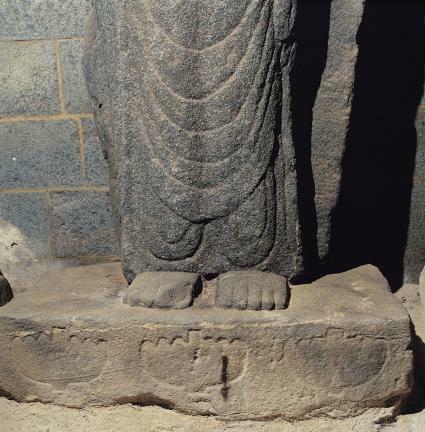 The robe draped across both shoulders descends in a U shape from the chest to the ankles. 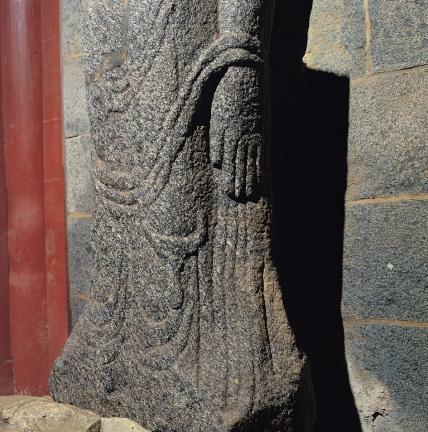 The stone mandorla, representing the light emanating from the Buddha’s entire body, and resembling a ship, was hewn from the same stone as the statue itself. The mandorla is badly damaged and has lost much of its detail. 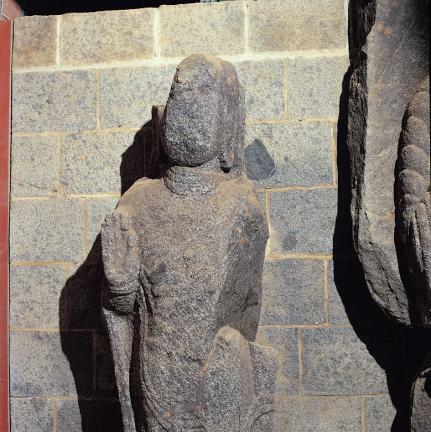 The assistant Bodhisattva on the left has been restored from its broken left shoulder down to the right hip. 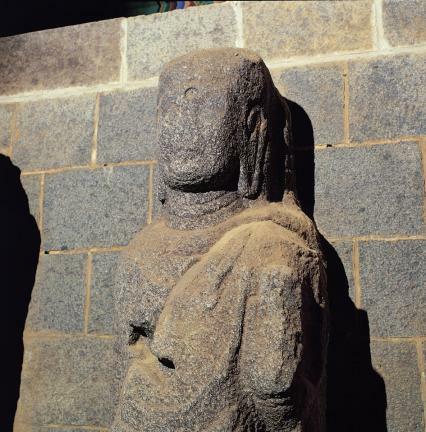 Its face is similar to that of the principal Buddha, except that it is much smoother. 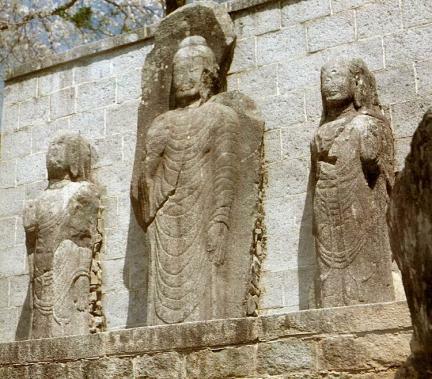 Its waist is turned left toward the principal Buddha. The bottom hem of its clothing is wide, displaying a dull, heavy expression. The assistant Bodhisattva on the right is much the same as the one on the left, except that it is more rounded on the whole and exudes a more childlike appearance. This Buddha triad exhibits excellent technical skill in the solid body, distinctive bodily details, and smooth body lines. 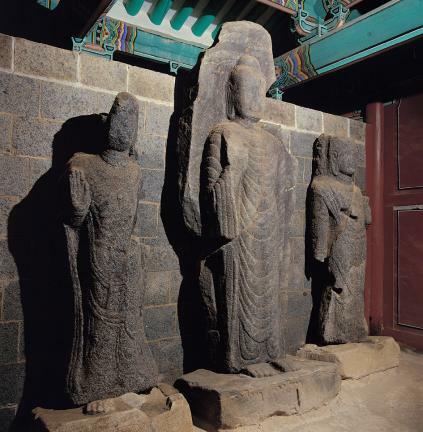 However, judging from the flat bodies and formal carving methods, it is assumed that this Buddha triad was made during the early Goryeo Dynasty.